The Twelfth Night is now behind us, and the Christmas decorations have been packed away for another year. It’s time to start looking forward to Spring 2016. I’m not one for setting resolutions, but this year I do feel I need to lose a little of the seasonal excess and get fit. And what better way than to get out and explore the great outdoors. Norfolk is the perfect county for walking, and the Norfolk Coastal Path is practically on our doorstep. 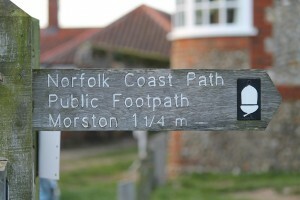 The path runs between Hunstanton and Cromer, and provides a clear route to easily navigate stretches of the coast. If you just fancy an amble rather than a yomp, then why not wander into the gardens of one of the many halls & gardens open to the public, such as Blickling, Felbrigg or the Sandringham Estate. Closer to home we can recommend Sheringham Park or Pretty Corner. The North Norfolk Railway, for me, is the focal point of Sheringham, and for good reasons. It’s a huge tourist attraction, run by enthusiastic volunteers, and it’s very character and style seems to define Sheringham. This is most evident with the many events run through the year, which often spill out onto the High Street and beyond. Our favourite is the 1940s Weekend (17th-18th December 2016), which sees Sheringham, Weybourne and Holt transported back 75 years into the past, with locals and tourists donning period costumes, and local shopkeepers dressing up their shop facades. 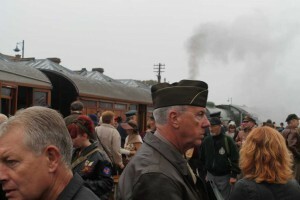 The station runs events through the year, in addition to a scheduled service between Sheringham and Holt. Sheringham Little Theatre is renowned for putting on ambitious shows, and during Easter it opens the stage to the stars of tomorrow with youth productions of hits such as Les Miserables. This year, this cozy venue in the heart of Sheringham is preparing to transport you to post-war Argentina with a youth production of one of my favourite West End shows, Evita. Evita will be running from Saturday, April 2th, until Saturday, April 9th. In addition to this, the theatre will be running a number of live events, live screenings, and movies, and will be host to the Summer Repertory from July.